Jenny Saville, Red Stare Head 1 (2011). Oil on canvas. 10 5/16 x 86 5/8 inches. © Jenny Saville. Courtesy Gagosian Gallery. Photography by Mike Bruce. 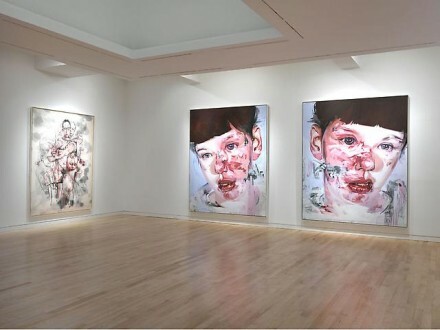 Her first exhibition in New York City since 2003, Jenny Saville‘s Continuum is on now at the Madison Avenue Gagosian Gallery. Writes Saville, “[Flesh] is all things. Ugly, beautiful, repulsive, compelling, anxious, neurotic, dead, alive.” In the multicolored paintings of the Stare series, the body and face are disturbingly laid open. The artist depicts flesh in all forms and colors, often grotesque, as seen in several mother and child paintings, which are also heavily influenced by Biblical imagery. “Continuum” doesn’t shy away from the human figure. Instead, Saville confronts it within, as the exhibition name suggests, a continuum of color and shape toward different end than other contemporary figure artists. In “Continuum,” the piece is a stable collection of components: far from positing an ephemeral figure and a shifting portrait, Saville’s figures may be ugly or starkly rendered but they are always present. Saville laments and celebrates a permanence of human identity and its representation, with aim to present the object in all its forms. 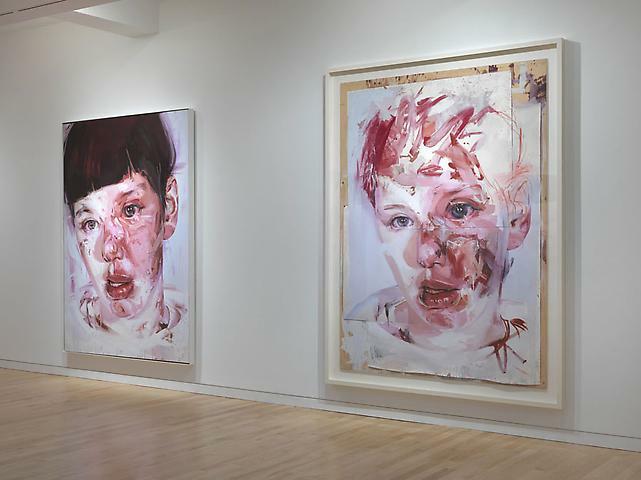 Born in Cambridge, England, in 1970, Jenny Saville studied at the Glasgow School of Art. The artist has had numerous solo shows at galleries and museums around the world, including Museo d’Arte Contemporanea-Roma, and Saatchi Gallery, London. Her work was included in the 2003 Venice Biennale, and in the 2009 exhibition Paint Made Flesh at the Phillips Collection in Washington, DC. Saville lives and works in Oxford. Jenny Saville, Isis (2011). Oil on canvas. 99 1/8 x 73 11/16 inches. 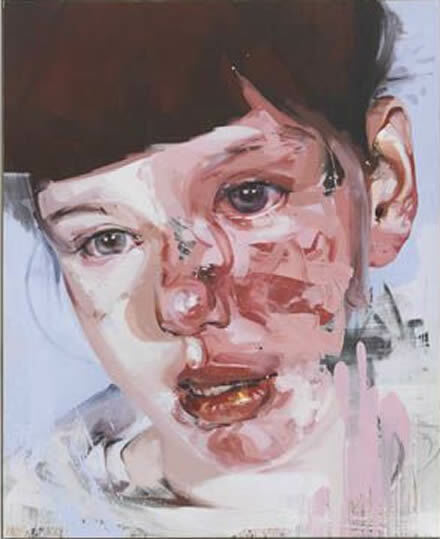 © Jenny Saville. Courtesy Gagosian Gallery. Photography by Mike Bruce. The People (London, England) November 13, 2011 Byline: Nick Dorman ; Jack McKay PAINTING half a picture was never going to work for Lewisa Jordan as she tried her luck with online dating. She simply had to tell would-be boyfriends her features were: “Brown hair, blue eyes, no legs!” Lewisa, 30, was born with a deformed lower body because of a one-in-a-million condition and learned to walk on her hands. Yet the courageous youngster did better than most – to become a prize-winning horse rider and Cambridge University graduate. Now, of all her achievements she rates the best as giving birth to her beloved son Ed after meeting and marrying the man of her dreams Graham Jordan, 32. And it all started with that brave text message when she was 21. Talking about it for the first time exclusively to The People, Lewisa said: “I was back at my parents’ house for the summer holidays from uni and I was really bored. “I thought I would try a text chatroom for a laugh, just something to pass the time.” She put her profile on an online forum operated by BT, recalling. “I did it casually, not expecting anything, but soon I got a reply from Graham saying hello. “He was really friendly and we sent a few texts back and forth. Lovely “When he asked me what I looked like I wrote ‘brown hair, blue eyes, no legs!’ He wrote back, ‘does that mean you’re short, then?’ “After that we started speaking on the phone and just clicked straight away. “He was just my type, funny, easy-going and intelligent but because he lived in Glasgow and I was in Lincolnshire I didn’t think anything would come of it. “Looking back, it was madness but after a few texts and three or four phone calls I invited him to stay with me in Cambridge. “I even went to pick him up at the airport in my car, which is specially adapted so I can drive. Graham knew what I looked like before he arrived because we had swapped photographs. We fell in love really early in our relationship. She said: “He knew I had no legs and he told me it didn’t matter to him what I looked like. “When he saw me he didn’t act any differently. He’s the kind of guy that’s so chilled out he’s practically horizontal, as they say. “Graham is such an easy going kind of guy and when he told me my condition wouldn’t be an issue for him I believed him. He put me at ease straight away. “He stayed for the weekend then he just kept visiting.” When she finished her teaching degree, financial worker Graham moved to Cambridgeshire and the couple set up home. She said: “He learned pretty quickly how to assemble my chair.” After three years living together they were married in 2005. It was their dream to start a family but they were afraid it might be dangerous for her. Lewisa said: “We looked at fostering but came up against a social worker who couldn’t see past my disability and made it difficult. She said: “I was quite excited but scared as well. We didn’t really know what was going to happen and it was a bit of an experiment. None of the doctors could give me much advice because they just didn’t know.” When Lewisa was born her parents gave her up for adoption because they couldn’t cope with her disability caused by the rare condition sacral agenesis. She said: “They were told I would be a constant burden and I’d never have any kind of life. “When I was fostered the couple who became my foster parents were even told I would not be able to read or write. “My condition was so uncommon the doctors didn’t understand all the implications.” As a baby Lewisa’s legs were badly deformed and at the age of four it was decided they should be amputated. She owes a lot to the love and support of foster parents Daisy and John Freshney. Lewisa said: “I was with them virtually from birth. As far as I am concerned they are my mother and father. I was encouraged to see myself as the same as everyone else.” She enjoyed a fully active childhood in Boston, Lincs, with Guide camps and riding lessons. At 18 Lewisa was representing the UK in international dressage contests for people with disabilities. “I was always accepted as a child,” she recalled. “The other kids saw I had no legs but it wasn’t an issue. “I wasn’t bullied. I went on the climbing frame with the others and if I got stuck they just give me a tug.” Lewisa did so well in school she went on to Cambridge for a BA in Education and achieved her goal of becoming a primary school teacher. But the prospect of being a mum was the greatest challenge yet. She said: “I was scared but when you are pregnant you can’t decide you can’t go through with it. As I got bigger I could do less and less and had to just lie down for most of the day. “During the last couple of months I was really tired and Graham was so sweet. He came home from work to make me lunch. “I spent my day either in bed or on the sofa watching films because I couldn’t move. “My belly was too heavy for comfort and I was exhausted.” Harder Ed was delivered by Caesarean a month before he was due in 2008. Lewisa said: “It was easy. I woke up and the hard part had been done.” Taking the newborn baby home posed more problems for the mum who had to look after her little one from her wheelchair. She said: “In the morning I had to strap him to me before edging down the stairs very slowly. “I was always scared I was going to fall forward with him. “He was a good baby, though, and didn’t cry a lot. But when he learned to walk he became harder to control. We stick to a routine. He has to hold on to my wheelchair when we go out. He will be cheeky and run off but luckily I can move faster than him.” Now a bright three-year-old and looking forward to going to school, Ed towers over his mum. Graham said: “Lewisa is the love of my life. I don’t see her disability in any way. I never have. It was never an issue for me. She is my soulmate.” Having grown up in a loving family, it is important for Lewisa that Ed has all the joys she had. She said: “We have one healthy baby I’ve always been of the mind that if someone says I can’t do it, I am more likely to do it. 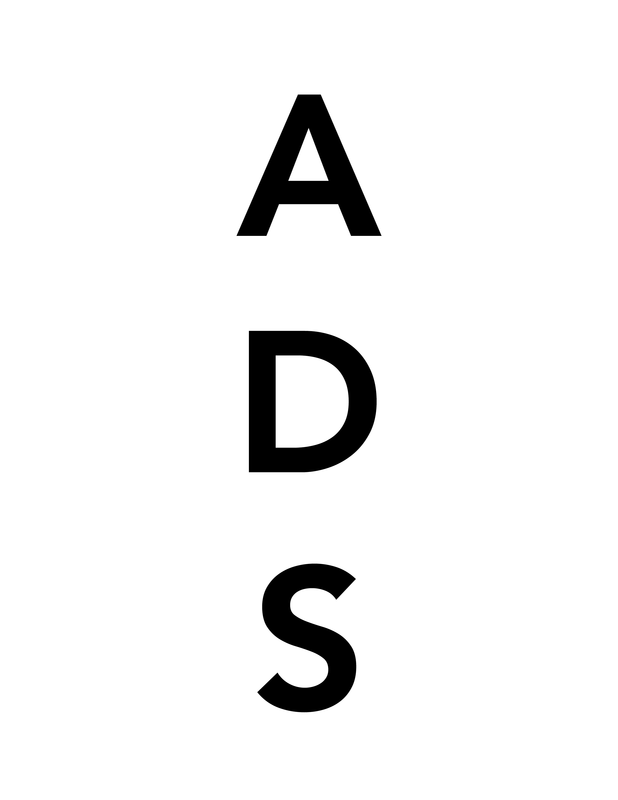 This entry was posted on Wednesday, October 19th, 2011 at 6:44 pm	and is filed under Art News, Go See. You can follow any responses to this entry through the RSS 2.0 feed. You can leave a response, or trackback from your own site.